Have you ever wanted to go on a date with your significant other but it wasn’t in the budget? If you have, you’re not alone. The average cost of a date these days can set you back over a hundred dollars. To me, that seams like a lot of money to spend on a single night, even if it is with your sweetie. Fortunately, there are lots of options that let you be with your honey without overspending your budget. Here are some date night ideas that you could try this year. Grab an old blanket, a variety of soft pillows, and a reasonably priced bottle of wine. Take your sweetie by the hand and lead them outside to star gaze. Lie on the grass side by side and enjoy the view overhead. This is a fun and non-traditional way to spend time with your partner that won’t break your budget. If it’s cold outside, get up off the ground to view the stars while you munch s’mores. It’s another of the date night ideas you could try together. Find a couple of lawn chairs or a cozy bench and add warm fuzzy blankets. Light a fire pit if you have one and toast your s’mores while cuddling up together. What could be more romantic than firelight and s’mores? Who says you have to go to a club to go dancing with your honey? Turn on some romantic music and move a few chairs in your house or apartment. Then twirl and sway to your favorite slow tunes while you hold each other tight. Going out and finding quality food on a Friday or Saturday night isn’t always easy. The restaurants that serve good food will be packed and staff will be rushed. In other words, you could receive a less than stellar meal by very stressed servers. You’ll be stressed too before the evening is over and that doesn’t make a great date night memory. Instead of overspending on a mediocre meal, why not cook a meal together? It’s another one of the date night ideas that won’t break your budget. At the same time, it allows you to spend time together doing something fun. The price of attending a movie these days has gotten out of control. But you don’t have to go out to catch a movie. That’s why another of the fun date night ideas to try is staying in together and streaming a new release. Don’t worry if your television screen isn’t the biggest or newest. That doesn’t mean you must splurge on new technology before your date night. Just make a few snacks, pick a great show, and cuddle together while you watch. While certain games require several players, not all of them do. Choose games that only take two players, put on some music and break out the munchies. Then play cards, Twisters, or other games that encourage close contact with your partner. Don’t rule out two player video games. There are plenty that you can play either against each other or as part of a team. Bowling together is one of the inexpensive date night ideas that won’t break your budget. Simply eat a meal at home before you go. That way, you only need to buy one or two drinks while you’re there. Rather than having a date night, try having a daytime date. Take your date to play at the park. You could swing, slide, climb the monkey bars, or play Frisbee. You might also be able to play tennis, basketball, or another other sport. Pack lunch and a bottle of wine or a few cold drinks along with a blanket to spread on the ground. When you get hungry, have lunch together on the grass or a nearby picnic table. Nothing says I love you like a relaxing massage. Pick up an inexpensive bottle of massage oil or make your own using essential oils. Light a couple of candles, put on soft music, and treat each other to a loving massage. If you know each other well, take a bubble bath together beforehand. Sometimes it’s nice to plan to do nothing together. Try taking a day off with your significant other and just see where the day leads. You could walk around your city or hometown together and see where you end up. Or, go for a drive with no particular destination in mind. At times, not having a plan ahead of time can lead to some great adventures. Even though it can be expensive to go on a date, it doesn’t have to kill your budget. 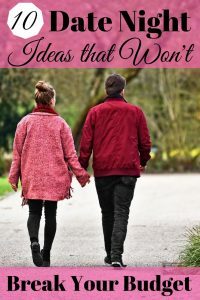 Try one or more of these date night ideas when you’re looking for solutions that won’t break your budget. What date night ideas have you tried that are inexpensive and still lots of fun? All are great tips for a budget-friendly date, you can also add “Do charity” there is several charity organizations that can benefit from people helping out. Its a great filter to know if your date cares and is involved, if that’s something you are looking for. Thank you for this list, ill be using it soon. That’s a good idea! It’s always important to help out different charities when you can and doing it together gives them twice the help. Yes, you will also get to see if the person you are dating is someone you want to continue to spend time with. Thanks for mentioning this different idea, it’s a good one! Your welcome! I hope you have great date nights ahead with your sweetheart! One of our goals for the year is to have quarterly date nights. Love this list of ideas – we have so many games sitting in the closet collecting dust! Yep! Games can be quite fun! You can even have your own frugal prizes, such as a kiss to the winner, dancing to their favorite song, or whatever else you can think of! Have fun with it and keep dating forever! I love smores. They remind me of my childhood camping with my family, cooking the smores over the campfire!! Thanks for the fun dating guide. Cooking together is great – not only for your date, but also as a family activity. Plus, you can have lots of fun and then watch a movie together. That’s right – it works as a date night activity or as a family activity too!